This program includes 50 record keeping forms to record and keep track of vital aspects of the "administrative" side of being a landlord. Unlike the the Rental Forms CD, which includes forms to communicate effectively and professionally with residents, the Recordkeeping Forms CD are for "your eyes only", to remind you of what to keep records of and for those helping you with the management of properties. Most landlords (specially the majority who do it on a part-time basis), try diligently to stay on top of the various challenges of rental properties. Often, however, there is not time in the day to handle full-time jobs, landlording duties, and also keep track of the "administrative" or recordkeeping side of the business. 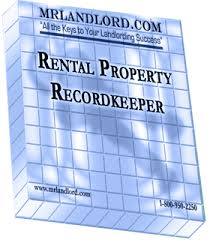 Even staying on top of the record keeping for one or two rentals can become overwhelming, if you do not have a simple system for maintaining your files and records. Use these forms to stay in control of your rental business. This Recordkeeping Forms CD provides all the forms on Microsoft Word documents. Regular price is $49. For a limited time you can order them for just $29. Plus you will receive a Bonus Binder with all recordkeeping forms on hard copy ($19 bonus value).